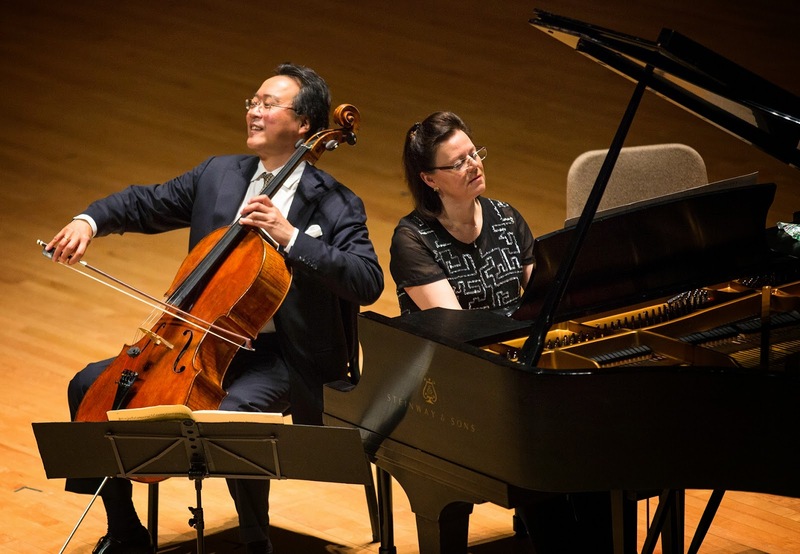 As musical marriages go, there are few happier ones than the long alliance between cellist Yo-Yo Ma and pianist Kathryn Stott (above), who brought a varied program to a packed Symphony Hall last weekend under the aegis of Celebrity Series. This globe-trotting duo - who have been performing together now for something like thirty years - often joke that at this point they don't even have to look at one another to guess what the other is thinking; on the concert stage, they're all but conversing as they might in the kitchen. They just happen to be speaking the language of Stravinsky and Brahms. Ma is certainly the greater celebrity, although on stage they're clearly equals - indeed to my mind, Scott is an under-appreciated wonder. Her playing can be either pearly or percussive (as required), and she has a way of suggesting musical space, particularly in spare arrangements, that's nothing less than remarkable. In fact, to tell true, I was often held more by her playing than Ma's - and perhaps in a few of their joint selections from south of the border (I know this is heresy!) her touch felt slightly more authentic. Not that our local star has lost any of his virtuosic edge - or any of his open, disarming charisma; both "Petunia," Ma's celebrated Domenico Montagnana cello, and her player were in fine form throughout this wonderful musical afternoon, which opened with repertoire from (or inspired by) more sun-kissed lands than our own. Of course any kind of warmth was welcome last weekend, so no wonder the crowd applauded early for Stravinsky's elegant Suite Italienne (drawn from the score for Pulcinella, with a nod to Pergolesi), before Ma and Stott headed even further south (to South America, no less) for dance-inflected numbers from Heitor Villa-Lobos, Ástor Piazzola, and Camargo Guarnieri. To be honest, I've heard the Stravinsky played with more fire, but Ma gave the cello line a light finish that cut cleanly against Stott's dancing piano, and the "Serenata" movement did heave a ravishing sigh. The South American trio was even more seductive, with Piazzolla's "Oblivion" a dreamy standout; later Ma wrapped the flamenco-esque Guarneri (which gave Stott to pound out a memorable stomp) with an intriguing shiver. But Ma really came into his own with de Falla's Siete Canciones Populares Españolas, which were composed directly after the composer had absorbed the styles of Debussy and Ravel in Paris. I'd argue Ma's greatest virtue (among many) is the expressivity of his long, singing strokes on Petunia, and these once more either shone in sharp relief against the prance of Stott's piano - in such selections as "El Paño Moruno" ("The Moorish Cloth") - or made the slower, softer melodies seem to glimmer like so many gems in a moonlit garden. But after these cross-over sojourns in the spaces between various traditions, the second half of the program landed more squarely in the "serious" concert hall, with the final movement of Messiaen's Quatuor pour de la fin du temps, and then Brahms' richly appointed Sonata No. 3 in D minor (Op. 108). The Messiaen, subtitled Louange à l'Éternité de Jésus ("Praise to the Eternity of Jesus") is among the most poignant statements of faith ever penned, for its "praise" is a long, tender sigh that falls repeatedly against the clock-like chime of the piano. Messiaen's markings on the piece read "infiniment lent, extatique" ("infinitely slow, ecstatic"), and here, although perhaps they never quite achieved ecstasy, Ma and Stott did seem to touch the cosmic, as the piano was once more a key component rather than a mere accompaniment to the cello line; she made you feel every second passing as time itself tolled its last. Finally came Brahms - whose sense of resigned maturity I've long felt was a Ma specialty; although here, after Messiaen, the great German sounded nearly light-hearted! Still, the cellist did not disappoint, offering up an especially tender third movement ("Un poco presto e con sentiment"), while Stott made the passionate most of the finale ("Presto agitato"). Of course the hall went wild, and demanded encores, and the duo returned to the stage with three crowd-pleasers. First came Elgar's much-loved Salut d'Amour, then a showcase for Stott (with Ma vamping along) Camargo Mariano’s dazzlingly intricate "Cristal." But on the final bow, the spotlight returned to Ma, with Saint-Saëns’ almost over-familiar "The Swan." It may sound improbable that Ma gave even this warhorse fresh life; but indeed, his singing line was suddenly imbued with a kind of probing detail. He gave us no languidly dying ballerina but an actual, swimming swan: we could feel every push against its watery bed, every moment of its tranquil, resting glides. Sometimes I worry, I admit, that the surface dazzle of Ma's virtuosity can conceal a slightly homogenizing sympathy; but the flip side of that concern is the undeniable fact that his curiosity and technique often renew what has become practically rote. This memorable concert closed on just such a note.